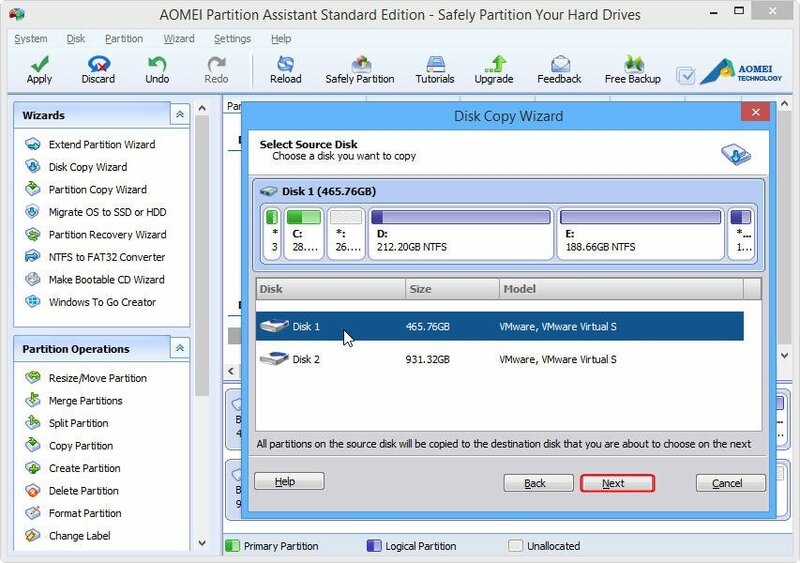 Unlike “copy” and “paste”, hard disk clone refers to copy all the contents on the hard disk to another one at one time. And you don’t need to copy each file one by one, which may be a time consuming work if you are going to replace your present hard disk with a new one. Furthermore, clone hard disk is more practical than “copy” and “paste”, because some system files can’t be accessed after you paste into another hard drive. So it is possible that you can’t boot system normally. With the development of the society, people’s life and work heavily reply on computer. With time goes by, the PC or laptop users require transferring data from old hard drive to a new hard drive thanks to the different reasons. In other word, users have to clone their old hard drive. Situation1: My present hard drive is 320GB, but with the daily increasing data, there is less and less free space on my hard disk. So I bought a larger hard disk. There comes a problem “how can I transfer all the data on the original hard disk to a new one”? I don’t expect to reinstall system and lose my essential data. Is there a way? Situation2: I work as a game tester, my job is to test the games developed by our company and find the bug. So I have high demand on loading time to guarantee my work going on smoothly. I decide to replace my HDD with SSD without data loss and no reinstallation is more perfect. How can I do? Can someone help me solve the problem? Replacing HDD with a larger one or upgrading HDD to SSD as I mentioned above are the most common reasons that make users clone hard disk to avoid reinstalling system and data loss. There has been great improvement in Disk Management from Windows XP to Windows 8.1, but you still can’t clone hard disk with this built-in tool. 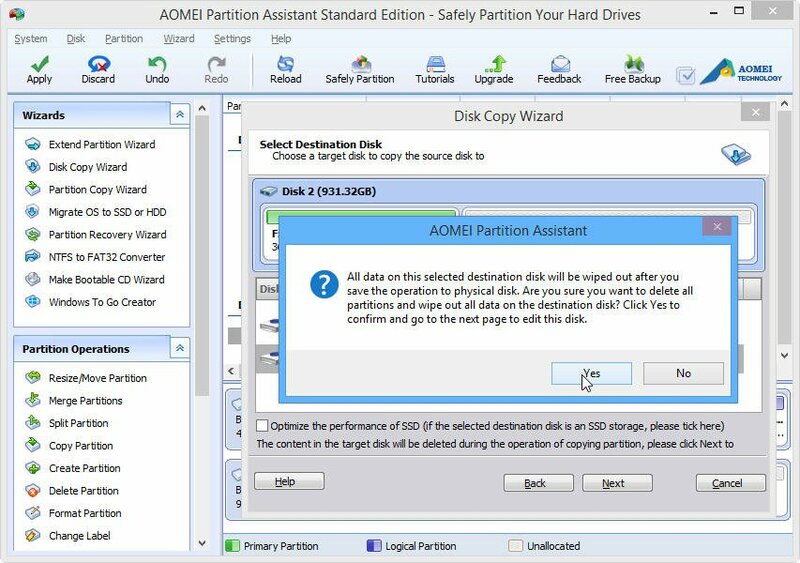 So AOMEI Partition Assistant Standard is a good helper for you. 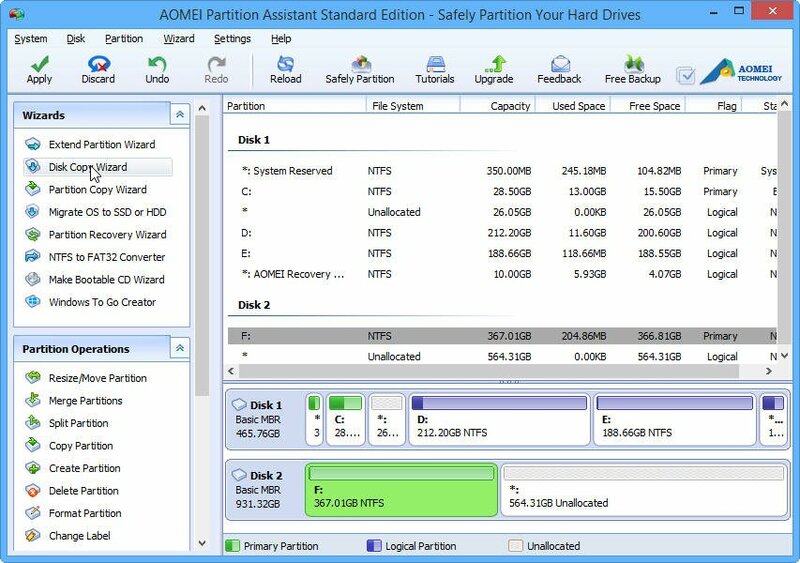 AOMEI Partition Assistant Standard is a free partition management software, which is specialized in partition management. With this free software, you are allowed to clone hard disk to another one without any data loss and reinstallation. Apart from this feature, it enables you to merge partitions, migrate OS to SSD, make bootable CD and so on. Make sure the unallocated space on the destination disk is larger or equal to used space on source hard disk. If the hard disk you want to clone contains system boot partition, the operation will be completed under the “PreOS Mode“. Copy disk will overwrite the space on the destination disk, so if there are important data on it, please back up them in advance. 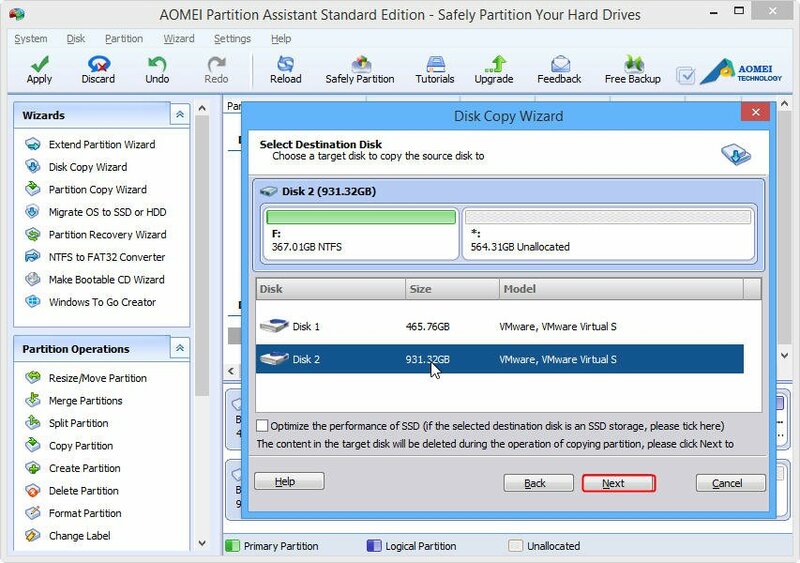 Step1: Download free software-AOMEI Partition Assistant Standard, install and launch it. Choose Disk Copy Wizard on the left side. Step2: In the following windows, select Copy Disk Quickly and then click Next to continue. Step3: In the pop-up window, choose the hard disk you plan to clone as source disk (eg. Disk 1). Then click Next. Step4: Choose the destination disk as the the place where you want to store all the data( eg. Disk 2). Click Next. Step5: Make sure you have right set ever thing and then click Yes to execute the operation. 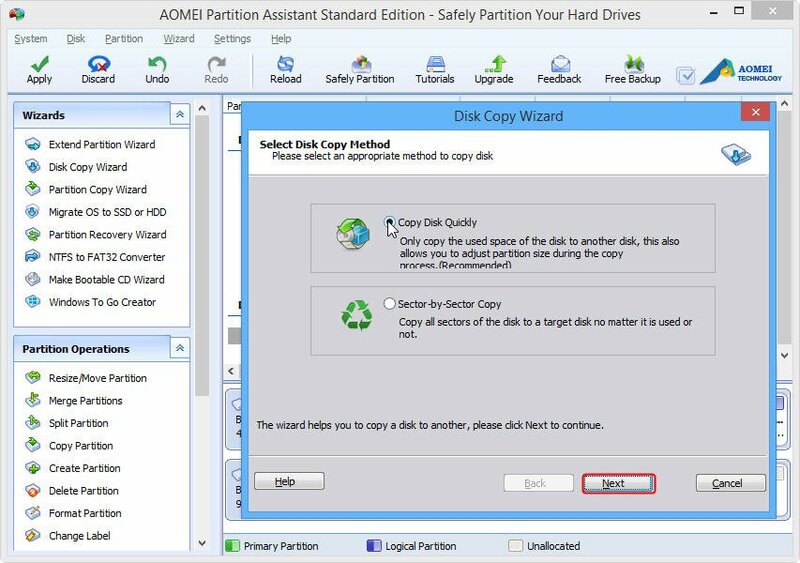 “Copy Disk Quickly” which only copies the used space of the disk (Recommend). “Sector-by-Sector Copy” which will copy all sectors of the disk no matter whether it is used or not. The former one takes less time. You can tick “Optimize the performance of SSD” to improve the reading and writing speed of SSD if the selected destination disk is a SSD storage in step4. The deleted or lost files can only be copied to the destination hard disk through “Sector-by-Sector Copy” method.